Someone that is close to you is finally hitting another 10 year milestone, wish him or her a happy 70th birthday so that he or she would know that you actually remember. 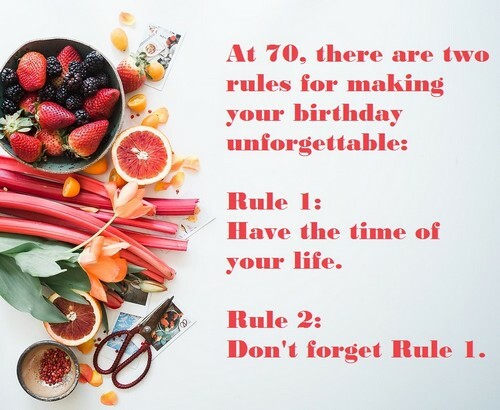 Celebrate with the one that you love or your family or friend the joy of a happy 70th birthday party as it is truly something to remember by, it should be something worth remembering. 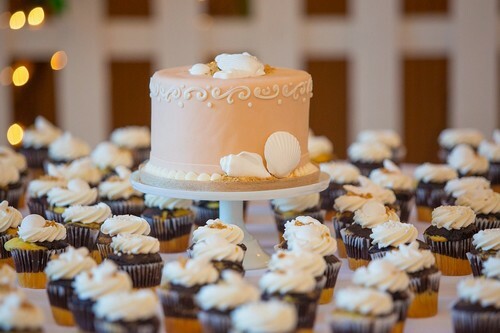 Throw the celebrant a party to remember or just let him or her have the time of his or her life. It is never too late to party, have fun and just enjoy life. 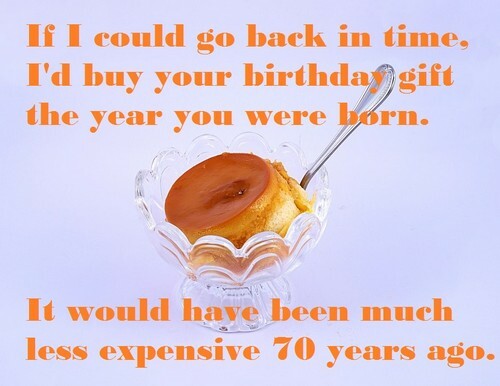 Here are some happy 70th birthday wishes for your use. Congrats on your new milestone, I wish you all the best in the future, and happy 70th birthday! May you have a grand time today and that everything in this life works out perfectly for you. Dance to the music and live a wonderful life for you deserve to do just that, enjoy your bday! You can dance under the rain if you wanted to, seventy is still a good old age to do just that. Happy 70th birthday, what you need is some jolly good time and just a light load of things too. Spend your time wisely, spend it with family, you should keep doing what you love to do too. You should appreciate nature, it means a lot to do that by this age, have fun on your bday too. A star is what you are and being born one is the best thing that ever happened to you as well. Let’s dance to the music, just like we used to years back, come on, happy 70th birthday, friend. Let us look forward to the wonderful future that is ahead of you, you deserve to be happy now. 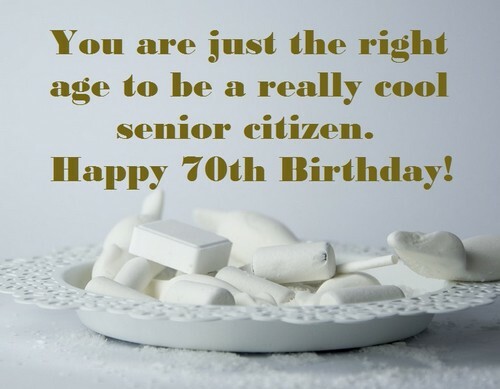 Turning 70 is one of the major event in life, so be proud of it, own it for it is your day as well! A lot of people dread turning seventy but I know you do not, I’m happy for your big day too! You never seem to let problems ruin your day, so have a good celebration of life today too! 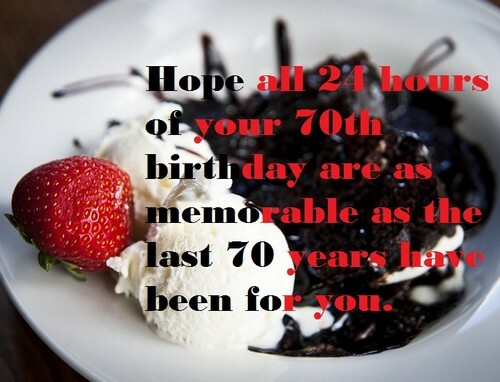 When no one else remembers, I can assure you that I will so just have a happy 70th birthday! The pain and the aches you will feel is coz of aging but do not let it bother you, happy bday. Every milestone is tricky on their own but this seventh one is truly a blessing happy bday, you! There will be more wrinkles on your face but also more reasons to be happy, enjoy your day! My dear Dad, I hope that you will realize that you are special to all of us here in your family. Happy 70th birthday, you are one of those people who are good at what they do, you rock. You will get back pains and the like more often but you can still have fun, enjoy your bday! Your bday is the type of day when you go all out to celebrate so do so and just have fun too. Growing gracefully is the type of thing that you should do so go ahead and do that, friend. On your bday show the world how strong you still are at 70, have fun on doing that now. I can still reminisce our old good times together like we used to, happy 70th birthday, friend. You deserve those hats on your head, for you are one of the best, happy bday, enjoy it all. Have the time of your day and your life, this will make your bday an unforgettable one dear. 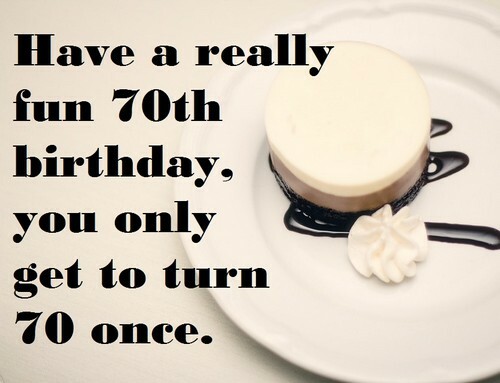 You may be seventy but that does not mean you should just disregard it, have a good party! There are so many things in this life that you should sign up for, and this bday is a new one! Never allow anyone to ruin your dreams, you can still have more today, happy 70th birthday! This is a new adventure for you, so go ahead and make new promises on your bday right now. A friendly reminder from me to you: you are truly wonderful so go ahead and have fun now! You deserve to relax, have some fun and have some more fun, so do so and enjoy your life! Go ahead, it is never too late to pursue the things you want in this life, happy 70th birthday! You are a step closer to being the best person you can be, so today just lay back and enjoy! Keep moving because that is the only thing to do, to move forward even at seventy, my love. Husband, you are still so amazing even up until now and I still wish you the best, happy bday. Do not say you would rather be but be it, go ahead and just have fun too, happy 70th birthday! I feel that you are one step closer to getting to where you want to be, I’m so proud of you too! May this twenty four hour celebration be something you will remember for the next years now. The last seventy years was surely a breeze and now here you are as gorgeous as ever my dear. You deserve to be at least a bit happy if not a lot, it is your big day, happy 70th birthday now. 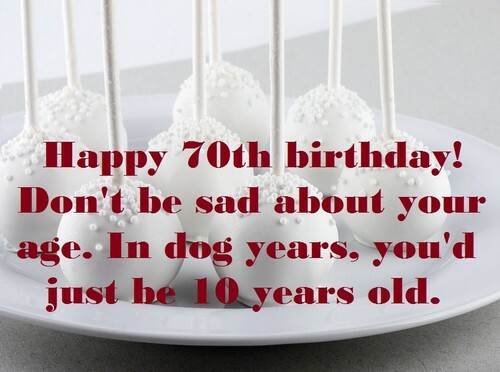 You may be 70 in human years but do not worry you are just 10 in dog years, you’re young! 70 is still young, do not think you are old, as long as you do not feel it, you are not it, okay? Happy bday, I wish we can comfort you and tell you how amazingly wonderful you are, now. Happiness is something you can only achieve through hard work and virtue, I love you so. Happy 70th birthday, you need to lighten up and just believe in yourself, remember that okay? Let us celebrate your bday like we had always done for the past sixty nine years now, love. I am contented just to be in your presence for that is something that no one can take away. For a good time in your life, you were happy and I hope you are happy now on your bday too. There are so many failures in your life but I hope this bday is not one of those things, my love. Nothing in the world can replace you in my life and in my heart so have a happy 70th birthday. Do remember that I am always going to be at your back, pushing you to the best, happy bday. Your bday is one of those days that you want to celebrate and have fun, come and do just that. Healthy is what you are so look at you, still fit at 70, keep using that gym to your advantage! When I look at you, I am awed by your wonder, thank you for everything you’ve done now. Forget the rest and just remember who was with you all through your life happy 70th birthday! What a beauty you are even now at 70, your skin still looks like pearls, happiest bday to you! We look at you and hope that when we reach seventy we would look like you do, happy bday. May you have a really happy birthday that you get to feel happiness inside of you as well. There are so many ways in which a person can be happy, one of them is by celebrating bday. What you deserve is to look back at the days behind you and look forward to the next ones! I will keep being the one you can hold on to when things go wrong have a happy 70th birthday. Keep making the right choices in life, happy 70th birthday, you are allowed to be wrong too. The years to come is what you should look forward to, enjoy your bday and make it count. 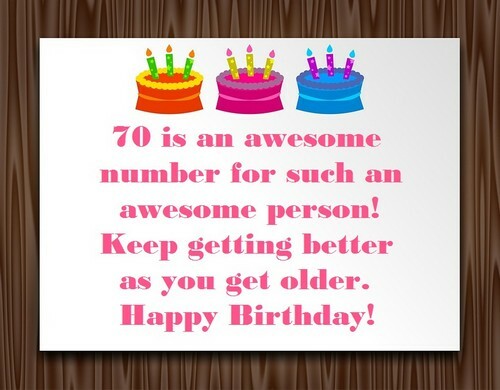 Blow out all of your seventy candles and have a good lung exercise for today, on your bday. I hope you have tons of failures that you can reminisce today and just laugh at, happy bday! Your mistakes are the things you would get to laugh at today, happy 70th birthday, do you? You are still young at heart so do not mind the number, your bday is what matters now, ok? When the time comes that you feel old, come to me and I will make you feel younger, love. Happy bday cheers to the dreams you have fulfilled before, make new ones with me today. I wish you had tons of things you can reminisce for today, happy 70th birthday, dearest mom. To the most wonderful woman in the world, I wish nothing but happiness and contentment. You are truly what it means to be young at healthy at 70, looking forward to aging like you. I want to be like you when I grow up, I bet you hear that too often by now, happy bday, Mom. Tell me more stories of how I used to be, Dad, happy 70th birthday to you, wish you so well. There is no better way to tell you how good you are at parenting than at your 70th birthday. You lit the road for me so I can walk to the right path, thanks and enjoy your big day, Dad. For all the lengths you have gone thru for me, thanks and have a good life from this moment. You and mom are the reason I believe in true love, have a happy 70th birthday to both of you! You deserve a rest coz you are one awesome person that needs some rest, happy bday now. What you need is some good rest and a good celebration, I will provide you with both today. For all the times you bought me cake, I will buy you one now with all 70 candles for you! Cheers to all the wonderful memories we have shared, happy bday and I love you a lot now. I have always wondered how it would feel to be as old as you are today, now I know, my dear.